Olá o meu nome é Fernando Gamboa, sou de Lisboa em Portugal… ohh wait I need to write this in English not Portuguese and it needs to be funny! Oh dear, a recipe for disaster! 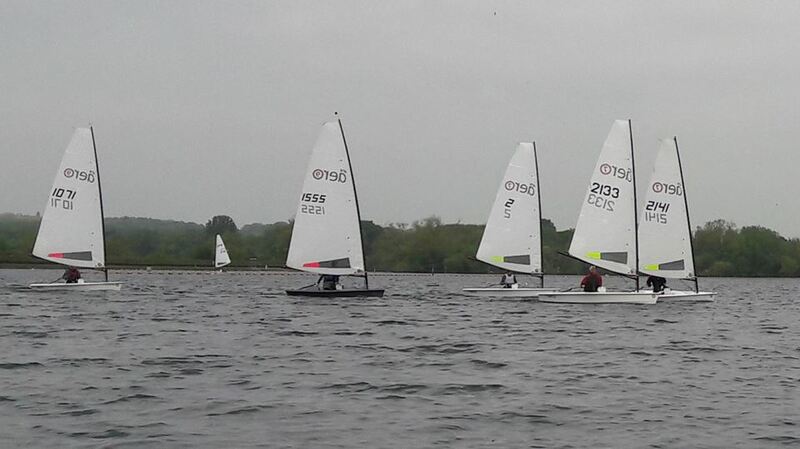 So the race report for the open meeting in Reading Sailing Club… When I said that I was going to race in Reading Sailing Club everyone said it was going to be very shifty. Well I live in Portsmouth and when someone says to me “That place it’s shifty” I, with my language limitations, understand that I shouldn’t go there ever. Nevertheless I drove up, bearing in mind that I might need to take care of my belongings. I arrived and saw all the friendly faces… well the one that I could remember at least. I still was a bit nervous, you know? Still I had the word “shifty” in my mind, so hands on the pockets. The lake where the Reading Sailing Club lives is a very pretty one and it was even worth of a photo sent back to Portugal. My parent’s reaction: “Talk later… we are at the beach”… They are nice folks really… when they don’t send me beach photos to make me jealous. Peter Barton opened hostilities with a 20 minute pre-briefing brief on RS Aero boat handling and sail tuning. It was really enlightening. I now understand why do you use so much quicker and outhauls. The fact that downhaul is so important to depower the Aero sail was also a surprise. Now the racing! The plan was to do 4 short races of 30 min each with a nice lunch break. The course coveried the entire length of the lake and all angles and this is where things got interesting. On the top part of the course the wind was very light, on the bottom part gusty and strong. As Peter mentioned in the brief - lots of changing gears! On the second race I was getting close to Ben who at this time was in second. Ben touched the windward mark, looked behind with a naughty smile asking for forgiveness. I considered it… well for 1 second… then kindly asked for a 360 turn. Sorry, puppy eyes don´t work on me. Nevertheless hats off for the effort. I became second now, heat going up as the pressure and Ben was closing fast. On the last beat to the line somehow Ben stalled the last tack. It was enough for me getting 2nd. For me was like experiencing an eclipse… extremely enjoyable but unfortunately a very rare event! Time for lunch with a fantastic long table laid with much cheese, pate and salad! A proper feast! I thought to myself “ I hope everyone is eating as much as me otherwise I will be the slowest, fattest but happiest person in the race. By the way bellies in Portugal are called Happiness Curves. The biggest the belly, or curve, the happier you are. The third race was a philosophical one, why you ask? Well, Emma Pearson decided to join the RS Aero 9s in the front with her RS Aero 5, such brilliant performance!!! I don’t know about the rest of the Aero 9, but I was thinking to myself “What am I doing here? What are the other ones doing here? What is the meaning of life now? …and most of all, why an Aero 5 is in front of everyone ?” Important philosophical questions of our time indeed. Well done Emma! 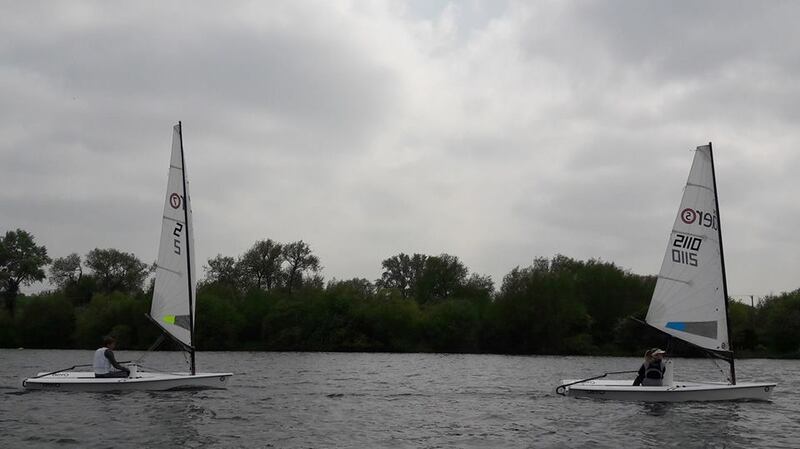 After 3 laps foiling Moth supremo, Chris Rashley, just pipped Emma’s ‘5’ in his ‘7’ rig on the finish line, enjoying the new challenge of the simple RS Aero on a small lake! The fourth and last race was the one where the locals shined. Paul Robson and Steve Sharp keep things very interesting. A proof that when Commodore Paul is not showing us how shiny is the bottom of his Aero (he capsized before, lots), he can keep up extremely well against the Aero 9. 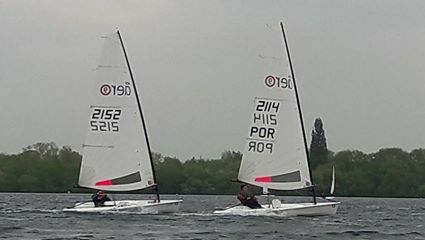 Well done for both Paul and Steve to show us that a ‘7’ well sailed is a very dangerous opponent. To summarize, Reading Sailing Club had indeed shifty winds which made all the races extremely captivating and interesting. We were received with a warm welcome and I had an excellent time with everyone. Thank you for receiving us so well. Ahhh almost forgot… I didn’t need to keep an eye on my belongings…Probably I should mention this on my tripadviser review as well, just in case. Ps: Someone needs to explain me why Reading, the city, and reading (the book) sound so differently, it’s confusing. 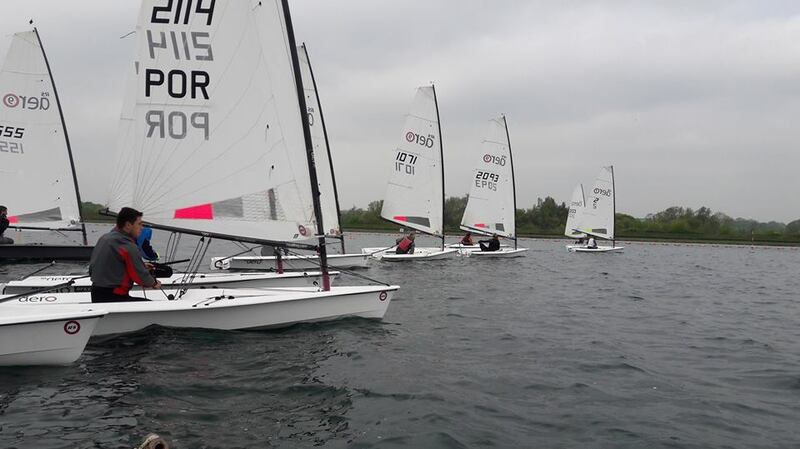 Next up in the UK is the RS Aero Eastern Areas at Downs SC on Sunday 21st May. If you enjoyed this report please visit the Y&Y report HERE, 'like' it and complete the REPORT OF THE MONTH slip at the bottom so that our hero, Fernando of Portugal, might win the Henri Lloyd Land Rover BAR cap that he rightly deserves.